The best snake boots are not made of snake skin, instead, they are made to protect your feet from snake bites. Anyone who hunts in areas that have potentially dangerous snakes slithering about will benefit from keeping their feet protected in a durable pair of snake boots. 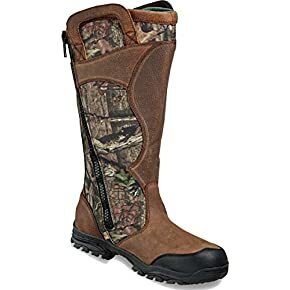 Even if you do not hunt, but you do yard work or any type of wandering about areas where snakes make their homes, snake boots provide necessary protection from potentially dangerous bites. 1. Snake boots protect from all snakes. Snake boots include several features that make them different from a typical hunting boot or work boot. When you start shopping for the best snake boots, you should know that you do not need boots that protect from a specific type of snake. 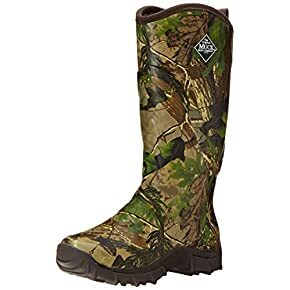 The best boots will protect from all snake bites, including copperheads, rattlers, and cottonmouths. The best snake boots will also be waterproof so you can wade through puddles and other moist areas. It is pointless to buy a pair of snake boots that are not made from waterproof textiles because you cannot use them out in the wild. They should also be lightweight, so you are not exhausted just by walking around your land. Along with being lightweight, they should also be comfortable on your feet. 4. They should be affordable. It is also a good idea that they fit in your price range, but it is good to know that snake boots will be priced according to the high quality textiles and features that have. The best snake boots are not cheap or cheaply made. 5. Snake boots should close up tightly. Finally, a good pair of snake boots should close up tightly with zippers, buckles, laces, or other closures that stay tightly shut. Along with snakes, snakes boots should close up to prevent other nuisances in nature from bothering your legs and feet. No one burrs or bugs to get into the boots. Ouch. These boots get our top rating because they have several features that make them an outstanding pair of snake boots. They are made of rugged nylon – so they weigh under two pounds. Unfortunately, nylon by itself does not offer much in the way of snake protection, so the toe and heel have abrasion protection and the outsole is made of rubber. No snake will bite through these boots. These boots not only provide outstanding protection from snakes and their fangs, but they also look great. The uppers are made of Mossy Oak camo and are 16 inches tall for plenty of protection from tall grasses and burrs. They zip close to keep your feet dry and the cushioned footbed makes them incredibly comfortable. The aren’t the most expensive boots on the market, but they are boots that would be considered an investment. The Irish Setter men’s boots are also waterproof and very comfortable. They have a shipping weight of six pounds, which is the lightest of all Irish Setter snake boots. Their soles are made of a composite mix that Irish Setter calls RPM, which is a synthetic product that snakes cannot penetrate. The uppers are made of waterproof leather and the lining has ScentBan to keep bacteria from building up and creating unwanted odors. Like the Rocky boots, the Irish Setter boots have a toe and heel with abrasion protection. These boots close with a lacing system that keeps moisture out and the tongue of the upper is cushioned for comfort. The instep is designed to make it easy to climb tree stands or to drive an ATV. These boots look tough and rugged with their camo print and leather trim. 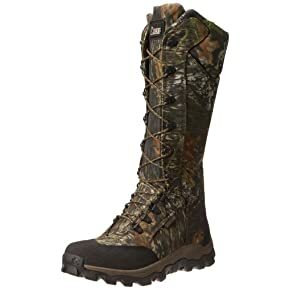 They are also appropriately priced for a pair of outdoor boots that protect from snake bites. These are the tallest boots on the list. 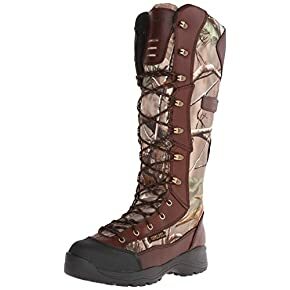 At 18 inches tall and covered with 1000-denier nylon, these boots will protect your legs from anything that could hurt them – especially snake fangs. LaCrosse made these boots waterproof with their Hyper-Dri lining on the inside to keep your legs and feet dry in the warmest conditions. They are comfortable with a cushioned footbed that is also covered in an odor-resistant membrane. Like the other boots on this list, the toe is abrasion-resistant, but the heel is not. The outsole is made of durable rubber. These boots are 80 ounces each, so they are heavier than others on the list (but they are taller, too). They close tightly with laces and a side zipper. They have a camo print that is accented with leather trim. They are priced similarly to the other boots on the list. MuckBoots has created a waterproof boot that can be worn in all weather conditions, even in the cold. They are covered in a Realtree camo print made of rubber coated with neoprene. MuckBoots added their XpressCool lining to keep feet cool on the hottest summer days and warm in the coldest of winter. They are extremely comfortable with a friction-resistant sockliner and a shock-absorbing sole. At 16.5 inches tall, they will keep your legs protected from rough grasses and prickly burrs. Snakes will not be able to puncture the tough rubber. These MuckBoots weigh 33 ounces each, which is lightweight for heavy duty snake-proof boots. These are slip on boots, so there is no way that any flora or fauna can get through them. They can be pulled on with the loop at the back. Wood N’ Stream has made some great looking camo and leather boots that are both waterproof and snakeproof. These zip up on the side and have Scotchgard protection. They are extremely comfortable with an EVA cushioned sole. The soles are slip-resistant rubber and the toes have tough abrasion-resistant coating. The upper is made of tough snake guard in a Mossy Oak camo print with tough leather trim. They have a shipping weight of two pounds, so they will not wear you down when trekking through the wilderness. These are the most affordably priced of all of the boots on the list. These are easy to put on with two pulls the sides of the boots. If you prefer your boots to be without camo print, these Danner snake boots will meet your needs. 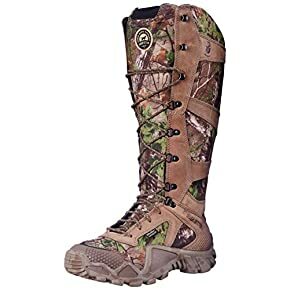 These attractive boots are designed in waterproof leather and 900-denier nylon which makes them impenetrable to snake bites. The soles are rubber and the shaft is 16-inches tall. The inside of the boots have GORE-TEX waterproofing that is also extremely breathable, which helps reduce odor, too. The hardware on the boot is not just for looks, the buckles can be adjusted to tighten the boot at the top of the foot and the back of the calf. 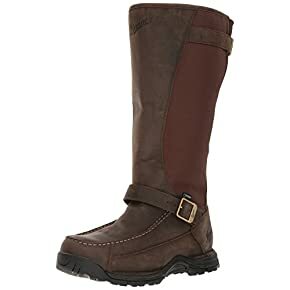 These are not just good looking boots, they are extremely comfortable and have orthopedic footbeds, too. They have a shipping weight of four pounds, but with the leather and GORE-TEX, the weight is expected. These are the most expensive boots on the list, so they are a real investment in foot protection and style. 1. How do you know if a snake boot is really “snake proof”? When boots are labeled as snake proof, they have been tested and proven to be puncture resistent. Many companies will stick balloons inside of their boots and use a real snake to try to bite into the boot. If the balloon pops, the boot is not snake proof. But, if the balloon does not pop under repeat testing, then it is snake proof. 2. How do you avoid getting bitten by a snake? The best way is by avoiding snakes. But, that can be difficult for people who work in the wild. If you have to be in areas where there are snakes, snake boots are one of the best ways to prevent being bitten. It is also a good idea to wear chaps over a pair of thick jeans. It is also a good idea to wear strong gloves if you know your hands will be on or near the ground in snake territory. 3. How do I know what size boots to buy? Most boots companies have their own methods of sizing. To make it easy for customers, they will put their sizes on their websites. Measure your feet prior to placing an order and use the methods that the companies suggest for accurate measurements. It is best to measure your feet at the end of the day. 4. Do I need special boots to wear around different types of snakes? No. Snake boots are appropriate to wear around any type of venomous snake. The best snake boots come in a wide variety of prices, styles, and textiles. All of the boots on our list are waterproof and are made of the best textiles, like dense nylon, full-grain leather, and waterproof GORE-TEX. They all have cushioned footbeds and interior textiles that wick moisture away from the feet. Your feet will be dry, comfortable, and protected from wicked snake fangs with any of these attractive, well-designed snake boots. Of course, the boots you choose should fit your needs, style, and budget, but no matter what, when it comes to protecting your feet against those dangerous fangs, your choice should be the best snake boots.